Since its inception, Sisters Vera Butler and Enid Storey have been the driving force of Lantern Light Ministry. Both individuals have helped to lay the foundation of the ministry, build up the services that it currently offers, and share how much of an impact the ministry has made for those living in the Greater New Orleans area with thousands of individuals from all over the world. Vera Butler, a native of Portmagee, County Kerry, Ireland entered the congregation as a novice after meeting the Presentation Sisters in Clonmel, County Tipperary for high school. She came to New Orleans more than 30 years ago and grew to love the city and the rich culture of the people. She has served in various positions with several organizations since that time. She was a teacher at an elementary catholic school, the director for the Presentation Sister’s US Province, and the Outreach Coordinator for St. Joseph’s Church before becoming the Director of Lantern Light. It was Sr. Vera’s suggestion that the collaborative discernment group consider what is now called Lantern Light as a ministry option, and since the beginning, she has had the privilege of developing and expanding the agency. Enid Story, a native of New York City, entered the congregation after meeting the Presentation community at St. Michael’s High School. She has served as a teacher and an administrator for her community’s infirmary before becoming an RN. Soon after, she ministered within the state of New York as a nurse in a community hospital, a parish outreach program, and a homeless shelter. She came to New Orleans in 2005 as a result of discerning a call two years prior from the Conference of Presentation Sisters of North America to form a collaborative community in the city. She arrived on the coattails of Hurricane Katrina and has considered her time in New Orleans as a great experience. Enid’s responsibilities have included assisting guests with medication referrals, administering and keeping records for TB Tests, obtaining ID’s and birth certificates, and lastly the coordinator of the lunch program. 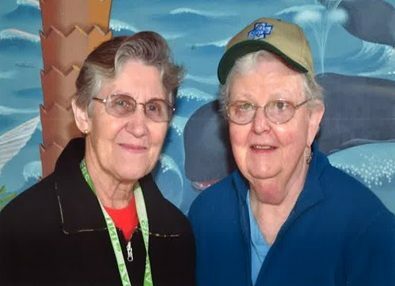 After serving the community for more than a decade, the North American Conference of Presentation Sisters decided that they would find another way for Sisters Vera and Enid to continue the work that they had begun through Lantern Light. They selected a dedicated group of volunteers to serve as the new Board for the organization and former Social Worker, Kenitha Grooms-Williams, who joined the staff in 2013 to continue their mission of serving the homeless and less fortunate. Kenitha Grooms-Williams, LMSW, A native New Orleanian, began volunteering with Lantern Light in 2009 after meeting Sr. Enid Storey at St. Peter Claver Church. She volunteered with Lantern Light while working on her Master’s Degree in Social Work after leaving a ten year career in Advertising and Public Relations. Several years later, she increased her volunteer time with the organization and was asked to join the staff as a Social Worker in 2013. Kenitha’s responsibilities have included obtaining ID’s and birth certificates, assisting with the food bank program and coordinating the notary services. She also resumed the food stamp application service after Second Harvest discontinued the program at the Rebuild Center, added services to apply for Medicaid, Child Care and Permanent Residency Cards, as well as expanding the employment assistance program. Kenitha is truly grateful for the opportunity to continue what she believes is a remarkable ministry for the homeless and less fortunate of New Orleans and knows that her work with Lantern Light has enabled her to fulfill her true calling, which is to serve. Catheryn Major, CSW, a native New Orleanian, began at Lantern Light as a Social Work Intern. She received a Bachelors’ and Master’s Degree of Social Work with Honors from Southern University at New Orleans. Ms. Major states that “from a very young age I have felt an overwhelming desire and passion to help others. With the field of Social Work I truly believe I have found my calling. My experience here at Lantern Light for the past year has been rewarding, humbling, and truly life changing. I enjoy assisting our guests in any way possible, and I look forward to the years to come! Beth Monahan, a native of the state of New York, spent 30 exciting and rewarding years at Corning, Inc. where she worked in research and development. In 2014, she needed to escape the upstate New York winter and decided to come to New Orleans for 3 months. After spending the first weeks doing essentially noting but eating, it became obvious to her that she needed to do something more productive. As luck would have it, an acquaintance in the city knew one of Lantern Light’s volunteers and the rest is history. She met David Hardin and Sisters Vera and Enid, and was immediately sold on the Lantern Light Ministry. Beth currently serves as the Kitchen Coordinator and states that, “after working here for only a few months I can’t praise the volunteers and staff of Lantern Light enough. Their hard work, commitment, and friendliness are amazing and so much appreciated. Brother Charles Avendano, originally from Seattle, Washington, joined the EDMUND RICE CHRISTIAN BROTHERS in 1943, He retired from the classroom after teaching and administering schools for forty-six years. For the next 17 years he served as a certified Ombudsman for senior citizens in the states of California, Washington, and Arizona. During that period he was also a Eucharistic minister to the homebound and those in hospitals. In 2010 Brother Charles arrived in New Orleans and began a ministry with the Presentation Sisters in Lantern Light. Since that time he has served in the kitchen area and for the past three years, as the volunteer postmaster for the guests.